In the Land of Milk and Money : State Sanctioned Rare Old Growth Native Oakwood Destruction On the Eve of First Dail 1919, 100th Year Commemoration. Download a copy of recent complaint by Macroom and District Environment Group concerning State licensed destruction of an old growth native oakwood in the townland of Silvergrove/ Doire Airgead in county Cork. Native Treevolution: The Woodland League Receive gift of Signed Che Guevara print by artist Jim Fitzpatrick, in presence of Glen Hansard. The Woodland League are delighted to have received a signed copy of the famous Che Guevara print, gifted by the artist Jim Fitzpatrick, at the Dolmen, known as Aideen’s grave, in Howth Castle grounds, last Saturday October 28th, 2017. The signed artwork will be auctioned at a later date to raise funds for The Woodland League, “Forest in a Box”, Native Treevolution project for national schools. The Woodland League, a County Clare based not for profit forest NGO are delighted to have received a letter from the President of Ireland, Michael D Higgins, in support of the new Diana Beresford Kroeger film featuring The Woodland League. “Call of the Forest”, is a feature documentary articulating the enormous value of native forests and their role in Climate mitigation measures, how native trees govern and manage our fragile environment, bestowing multiple hidden benefits for all life forms. After playing to full houses across Canada, Call of the Forest is now launching in Ireland at the OFFline Film Festival screening at the Birr Arts Centre at 7:30 pm on Saturday, October 14, 2017. Director Jeff McKay, Diana Beresford-Kroeger, Andrew St Ledger, PRO, of The Woodland League, and Mary Reynolds the well known landscape designer, will participate in a panel discussion after the screening. It is with great regret that we have received the sad news of the peaceful passing over of our Great friend, Father, family man, tireless community worker, tree and nature lover, Woodland League Director and long time supporter. Ken Doyle RIP (1951 to 2017). We wish to extend our deepest condolences to his family and friends and express our gratitude for his efforts on behalf of trees and communities. Join us this Saturday 29th July in MacNamara’s, Killaneena, East Clare for what will be a fantastic night of entertainment, in the realm of, “The Great Forest of Aughty”, restoration project. 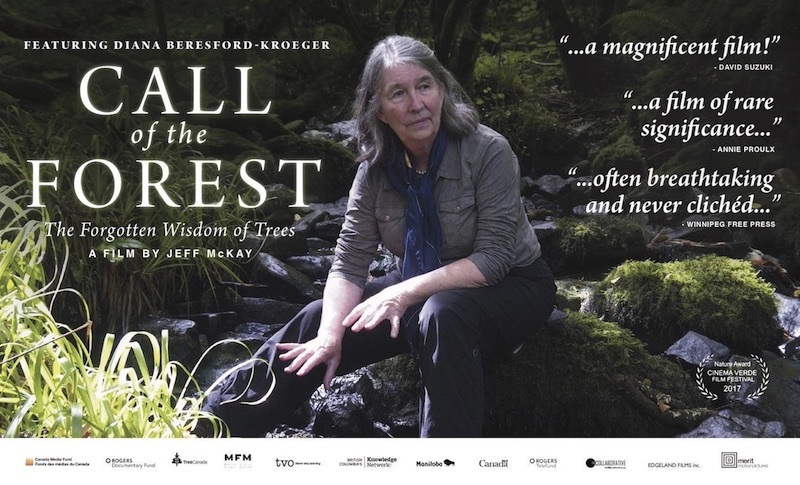 Kicking off at 8 pm, with the amazing film, “Call of the Forest”, by the visionary Diana Beresford Kroeger. Followed by well known Reggae selectors, Jason Rootical Soundsystem supported by Saoirse Sounds. Since the McCarthy report of June 2009, the selling of Coillte, and Ireland’s entire public forest estate, has been on the cards. The Woodland League, have always suspected that Coillte was set up a) as a vehicle to facilitate the extraction of huge grants from the EU, and b) to consolidate, and sell off, a major Public asset, the largest land bank.